Note: This is the downloadable product. A CD version is also available. Documents such as the Declaration of Independence contain words and phrases that are often difficult for students to understand. 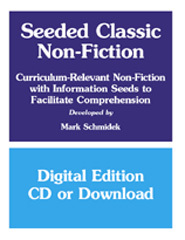 Text "seeds" have been added to the non-fiction works in this product to facilitate comprehension of vocabulary, phrases, and factual information that may be unfamiliar to students. Seeded text helps students read complete editions of non-fiction works independently. This product also includes seeded excerpts from famous speeches, diaries, sermons, essays, memoirs, and novels that are often used in the classroom curriculum. A CD with this product is also available (see options below).